The San Clemente or San Clemente Island Goat is a man-made breed that was selectively bred by nature to create a sturdy, deer-like animal! Kept mainly as pets, there are less than 200 San Clemente Goats worldwide.San Clemente Goats are intelligent and the hand-raised kids are quite tame. In fact, because of their small size and almost carefree dispositions, they are extremely popular as pet goats! 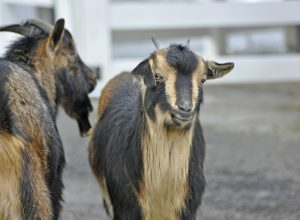 San Clemente Goats, after years of fending for themselves in the wild, are disease and parasite resistant and are unusually hearty. These goats have been known to survive on very little or poor quality feed. At maturity, San Clemente Goats are only 55 to 75 centimeters tall, just missing the Dwarf Goat height classification! Males are a little taller than females. Both buck and doe San Clemente Goats have horns. Once they were available in a wide variety of colors, but today they are mainly red or tan with black accents. The bone structure of San Clemente Goats is very fine, and because of their lightweight appearance and slender, strong legs, they have been described as “deer-like”. Although they are not particularly prolific milkers, San Clemente Goats have been milked and a few have been registered with the American Dairy Goat Association! They have also been used for meat, although today they are highly valued as pets. Originating from Spanish goats, which were left in the 1500’s by Spanish explorers or possibly by shipwrecks, San Clemente Goats come from San Clemente Island off the coast of California. Most probably their ancestors were left to provide fresh meat for explorers who had been at sea for extended periods of time. In the following centuries it is believed that the Spanish missions may have added goats to the island’s population. These goats ran wild for centuries and nature selected out her own hardy breed. In 1934, the United States Navy came into possession of San Clemente Island and its 11,000 head of goats. After hunting and trapping failed to remove the goats, they were systematically picked off until 4,000 remained in 1982 and an extermination program was proposed. The Fund for Animals fought this initiative and won. This group removed the island’s goats by helicopter. Most of the San Clemente Goats were neutered and placed in homes across America. Today, an interest has begun for this rare breed, of which only about 200 remain. 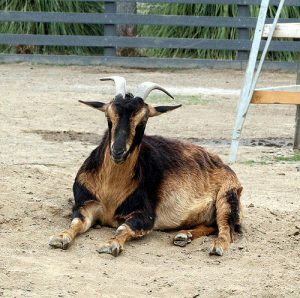 Those who adopted the original San Clemente Goats have done their best to preserve and breed these animals, which they love and value as pets! 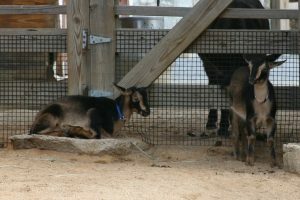 San Clemente Goats are extremely hardy and need very little special care. Being disease and parasite resistant, veterinarian visits are rare, but your goat will need to see a vet regularly to discuss vaccinations and dietary needs. Also, a relationship with a veterinarian experienced in goat care is necessary should an emergency arise. They make wonderful pets and can even serve as weed control for your land!Generally, San Clemente Goats birth their kids in February. It is quite common for does to have twins. They are known for their strong maternal instinct and are protective, attentive mothers to their sturdy offspring.